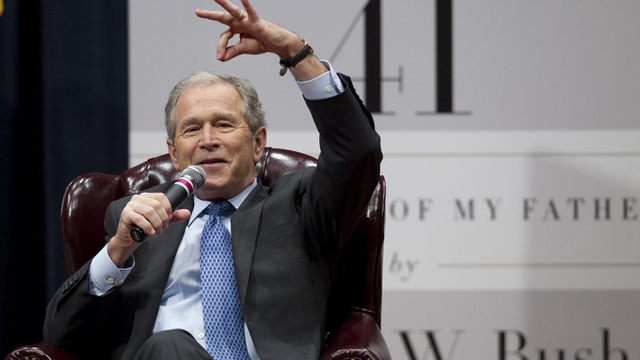 COLLEGE STATION — Former President George W. Bush, invoking what he said were the wishes of his 90-year-old father, on Tuesday practically begged his brother Jeb to run for president. Bush, who was at his father’s presidential library to promote a new book he’s written about him, was careful to say that his brother, the former governor of Florida (and father of Texas Land Commissioner-elect George P. Bush) was “making a very personal decision” and could not be pressured into following his sibling and father into a White House run. But the 43rd president pointedly shot down one of the misgivings his brother has aired publicly: that going back and forth between Bushes and Clintons (first Bill, and now possibly Hillary) highlighted a potentially worrisome trend. For years, Bush critics suggested that he wasn’t intellectually fit to be president, and 43 — who got his undergraduate degree from Yale and an MBA from Harvard — leaned into the reputation Tuesday.